Although Barbara has now retired from teaching City & Guilds she still teaches Summer school classes at Missenden Abbey and will give talks and run workshops when requested. 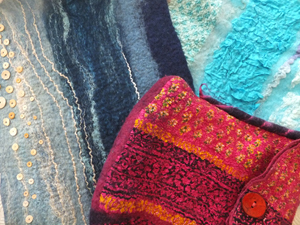 Wool Fibres and silk cloth are exciting and luxurious to work with. With minimal equipment and the most basic skills a sumptuous fine cloth can be created. To see an outline of the workshop please click here. Wool fibres are exciting and luxurious to work with. 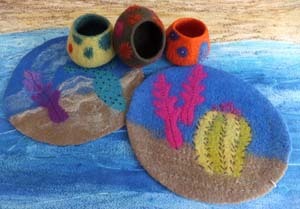 Learn to create felt from fibres and imagine the potential! A digital presentation, along with plenty of Quilts and Felts, to show my inspiration and working methods. I continually update this with new work and welcome interactive discussion. Lots of examples in the Portfolio Gallery. Please contact me for full Workshop and Lecture details, fees, equipment requirements and availability.